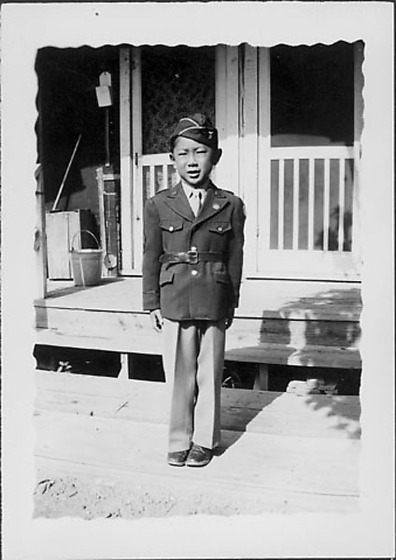 Boy dressed in a United States Army dress uniform stands with arms at his sides on wooden porch steps in front of barracks at Rohwer concentration camp, Rohwer, Arkansas, August 6, 1944. The uniform includes light-colored slacks, belted jacket with circular pin on lapel over light-colored shirt and necktie, and a dark overseas cap with a pin on proper L. Two white-trimmed screen doors in background; letter box to L of doorframe above metal bucket. Image has irregular scalloped border. Same boy in 97.292.11D. Stamped on back, C: AUG 6 - 1944.